It had been a few years since I had a winter wedding in Jasper, so I was excited for Robyn & Jason’s Jasper Park Lodge winter wedding. The weather in Jasper is a little unreliable and I found myself driving into town with very little snow on the ground! That’s a little disappointing when you plan your wedding for January and expect for it to be winter! Luckily I had time to scout locations and managed to find a spot that was wintery… but we will get to that later. I met up with everyone at one of the cabins for getting ready and then we went to the main lodge for the ceremony in the ORSO Annex. After a short ceremony we headed outside for photos on frozen Lac Beauvert and a few outside near the cabin before hitting the road to look for winter. I managed to find a spot at Maligne Canyon that wasn’t snowy, but there was a gorgeous layer of hoarfrost so we still managed to get the look of a winter wonderland for the photos! Here’s some of my favorite photos from Robyn & Jason’s Jasper Park Lodge winter wedding! Are you planning to get married? 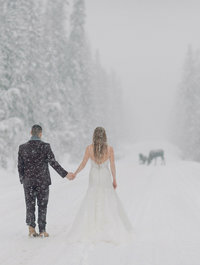 Are you looking for a Jasper Park Lodge winter wedding Photographer for your Canmore wedding? ENV Photography would love to be the one to capture your intimate wedding or elopement in the Canmore area! Please get in touch for more information on weddings & elopements in Canmore, Banff, Lake Louise and other mountain destinations. If you aren’t in the market for a Jasper Park Lodge winter wedding photographer, ENV Photography also photographs maternity, kids & families in the Rocky Mountains! Want to see some more winter weddings? 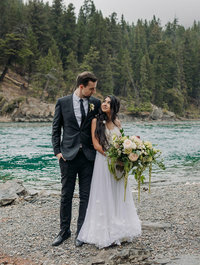 Check out this Winter wedding in Emerald Lake! 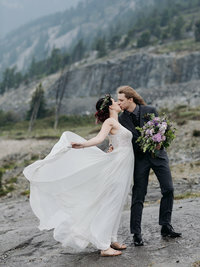 Or this Winter elopement at Lake Louise! 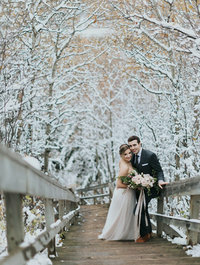 Or this intimate winter wedding at Creekside Villa in Canmore!